We can choose food items packaged in reusable containers as opposed to food packaged in disposable containers. We can refuse to accept plastic straw during purchase of beverages. In this way, we can take every opportunity to reduce our use of plastics. India currently uses around 15 million tonnes of plastics a year and is expected to use 20 million by 2020. The aphorism was used by the scientist and science fiction writer, Sir Arthur C Clarke, and later by Apple Computer co-founder Steve Jobs as a preface to their optimistic extrapolations about the future of technology. Though this is true for practically everything today, it is an appropriate description for the future of plastics and polymers. In the fullness of time, plastics might drive out metals from all spheres of human activity ~ something even the science fiction writers have not envisaged as yet. From the very beginning of human civilization, we have used a variety of materials to satisfy our needs. Till the 19th century, man’s inanimate possessions ~ his home, his tools, his furniture ~ were made from metals, stones, woods, ceramics, glasses, skins, horns and fibers. The early 20th century (1907) witnessed the invention of the first totally man-made plastic, Bakelite, by the Belgian chemist, Dr. Leo Hendrick Baekeland, popularly known as the ‘Father of the Plastics Industry’. It was deemed as a miracle invention. The subsequent period witnessed dramatic changes in developing the most efficient economic and durable plastics through the commercial synthesis of PVC (polyvinyl chloride), Teflon (tetrafluoroethylene), Nylon, PET (polyethylene terephthalate), and PE (polyethylene). The term ‘plastic’ is derived from the Greek word ‘Plastikos’ which means a material that is ‘capable of being shaped or moulded.’ Chemically, plastic is a polymer or a long chain of monomers, which are essentially made up of carbon and hydrogen linked by chemical bonds that are too strong to break. No plant/animal/bacteria has the ability to break the bonds between carbon and hydrogen atoms of the monomer of plastic. This makes plastic not only nonbiodegradable but virtually indestructible. Plastic is truly a miracle material as it takes between 500 and 1000 years to break down. The development of polymerization is one of the most significant contributions of chemistry in the twentieth century. There is today a so-called “empire of plastics”, an unstoppable juggernaut on the material scene, that gathers strength with each passing day, forever maintaining its momentum of growth by gradually dwarfing giants like metals and rubber and taking visionary strides into the future. The same polymer having identical composition appeared before us with a widely different range of properties. New varieties of plastic are being invented every year. Some of these are stronger than steel. Plastic is more flexible than rubber, more conductive than copper, and resistant to flame. The scope of value addition in plastic is also tremendous. Plastics are now light , sterile, cheap, durable, aesthetically appealing, preserving natural resources, conserving energy and in general improving the quality of life. The most important feature of plastics is that it has something for everybody ~ from the poorest to the richest. The increasing use of plastics has helped produce a wide spectrum of societal goals, such as eradication of poverty, improvement in the quality of life, employment generation, regional dispersal of industries, improvement of the water distribution system. The per capita plastic consumption in India is much lower (11 kg per capita per annum) as compared to the global average (28 kg), and per capita consumption in developed countries such as the US (139 kg) and the European Union (65 Kg). Plastic is irreplaceable. It is here to stay. But the miracle material is not an unmixed blessing. A report in Scientific Advances, 2017 suggests that a mind-boggling 8.3 billion tons of plastic has been generated since the beginning of the plastic era and the bulk of it has just been discarded. This plastic, if spread out, is enough to cover Argentina, the eighth largest country in the world. Only 9 per cent of the plastic produced till date has been recycled and 12 per cent incinerated. As per the current estimate of the UN, we produce about 300 million tons of plastic waste every year. The UN has warned that by 2050, around 12 billion tons of plastic waste will be generated globally. In India, the recycling rate is relatively high ~ almost 60 per cent as compared to the global recycling rate of 14 per cent. The miracle material is also an unnatural disaster. While it has many valuable uses, we are generally accustomed to the one-time use or disposal plastic. This can have severe environmental consequences. According to the UN, the most commonly used plastic worldwide can be found in cigarette butts, plastic bottles and their caps, straws, food wrappers, carry bags and disposal cookery. Half of all plastic produced is designed to be used only once and then thrown away. ‘Single-use’ plastics are often found at the bottom of the soil and water resources. This pollutes the environment. Moreover, they block waterways and exacerbate natural disasters like floods. High concentration of plastic materials, particularly plastic bags, lead to toxic chemicals that eventually enter the human food chain. Disposal of plastic waste by burning in open-air pits releases harmful gases, such as furan and dioxin. Plastic in garbage dumps and landfills interact with other chemicals and water to release toxin, which ultimately reach the groundwater reserves and soil. There is sufficient data to prove that our oceans contain a mind-blogging 150 million tons of plastic waste. Moreover, according to a 2015 Worldwatch Institute report, between 10 and 20 billion tons of plastic end up in the seas every year. A substantial portion originates in the world’s rivers, which serve as direct conduits of trash from the cities to the marine environment. Globally merely ten such rivers carry more than 90 per cent of the plastic waste that ends up in the oceans. 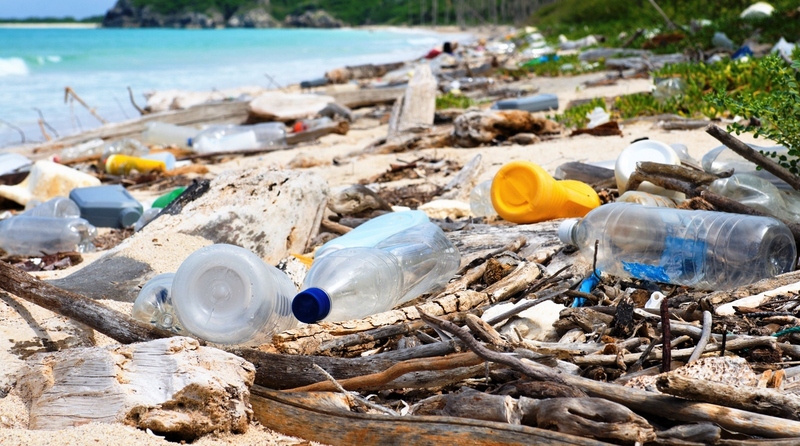 This causes massive financial losses, estimated to be in the region of $13 billion annually, resulting from the negative impact of marine debris on marine ecosystems, the economic loss suffered by tourism and fishing sectors and the financial cost associated with coastal cleanups. According to Greenpeace’s 2006 report: ‘At least 267 different species are known to have suffered from entanglement or ingestion of marine debris including seabirds, turtles, seals, sea lions, whales and fish. The scale of contamination of the marine environment by plastic debris is vast, and can be found floating in all the world’s oceans, everywhere from the polar regions to the Equator.’ The amount of such plastic debris will outweigh all the fish in the oceans by 2050 unless a concerted effort is made. We can choose food items packaged in reusable containers as opposed to food packaged in disposable containers. We can refuse to accept plastic straw during purchase of beverages. In this way, we can take every opportunity to reduce our use of plastics. India currently uses around 15 million tonnes of plastics a year and is expected to use 20 million by 2020. As many as 25 states have banned different varieties of plastic over the past two decades, but the implementation of the ban has been sluggish.